MERCATOR,G./ HONDIUS,J. - Aeneae Troiani Navigatio. Aeneae Troiani Navigatio. - MERCATOR,G./ HONDIUS,J. Title : Aeneae Troiani Navigatio.. Size : 5.9 x 7.4 inches. / 14.9 x 18.8 cm. 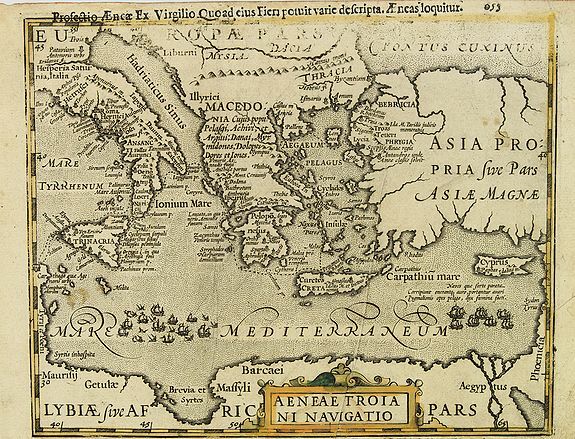 Description :Early map of the eastern part of the Mediterranean depicting the journey of Aeneas from Phrygia (Turkey) to Rome. Condition : Some age toning of the paper. Faint water stain affecting the lower margin and the title. Impression slightly faded away on top. 2 minor spots upper right & lower left.